We engage with our clients for the long term, delivering integrated, end-to-end solutions in a way that mitigates risk for our clients and ensures an ultimate business benefit. Any successful solution implementation starts with the right kind of engagement. Central to Eclipse's service delivery model is the belief that we can add value to your business by engaging with you at the right level from day one. As such, an Eclipse director will work with you during this initial phase to determine your high-level business and technical requirements and will continue to be involved with you throughout the solution implementation and beyond. The objective of the planning stage is to finalise and document the detailed scope of the project and to produce a plan for implementation. We've packed 28+ years of solution deployment best practice into our approach and methodologies enabling us to deliver projects efficiently and often within significantly reduced timeframes, without compromising on efficacy, when compared to similar implementations. The design stage is the culmination of all that was learnt during the previous phases by defining how your solution will be configured to meet your organisation's business and technical requirements. This phase sees the Eclipse Consultancy team produce detailed design documents in order to efficiently implement the solution. The Build Phase of the project applies the system design to configure the application to meet the business and technical requirements of your organisation. With 28+ years of system delivery experience we apply our own best practice approach to your solution implementation. 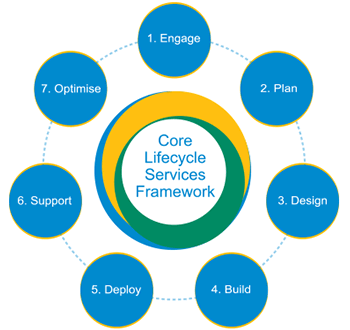 The ultimate deliverable from the Deploy Phase is a live working system that has been fully tested and signed off by your organisation. The Deploy Phase is geared towards go-live and as such we first conduct the necessary end user training in order to ensure that you gain maximum benefit from your system. For us the Support Phase is in many ways the most critical factor to the success of any project. The on-going efficacy of any implementation is measured by its performance over time and the right support for the long-term is vital. In order to help your organisation get the most out of your implementation over the long term, Eclipse will work with you in a proactive manner to deliver a number of strategic value-added service offerings. These strategic reviews are bundled as part of your maintenance and support agreement whilst performance tuning and regular databases audit and reviews can be purchased as one-off or recurring consultative engagements. To achieve Modern Finance status, organisations are looking to improve their core accounting and finance processes. These tools can enable organisations to take their reporting to the next level. These solutions help organisations to streamline and automate processes. Combined software, services and ongoing support tailored specifically for organizations in publishing, merchandizing & media & ents.